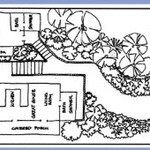 Our goal in constructing Windwardside Guest Cottage was to provide a romantic haven packed with amenities but at a reasonable price. 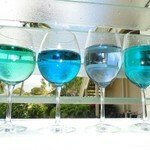 We have many honeymoon guests that choose Windwardside Guest Cottage for precisely this reason. It is a budget home that won't make you feel like you have made any compromises. 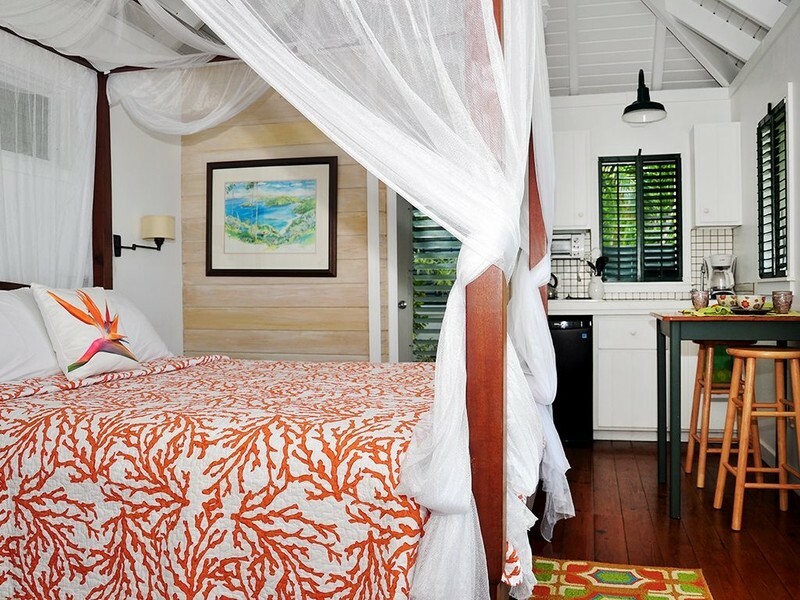 But the cottage is not only for honeymoon couples- it is a quaint and lovely cottage for any visitors to the island that want an intimate experience of our beautiful island with a gorgeous view. 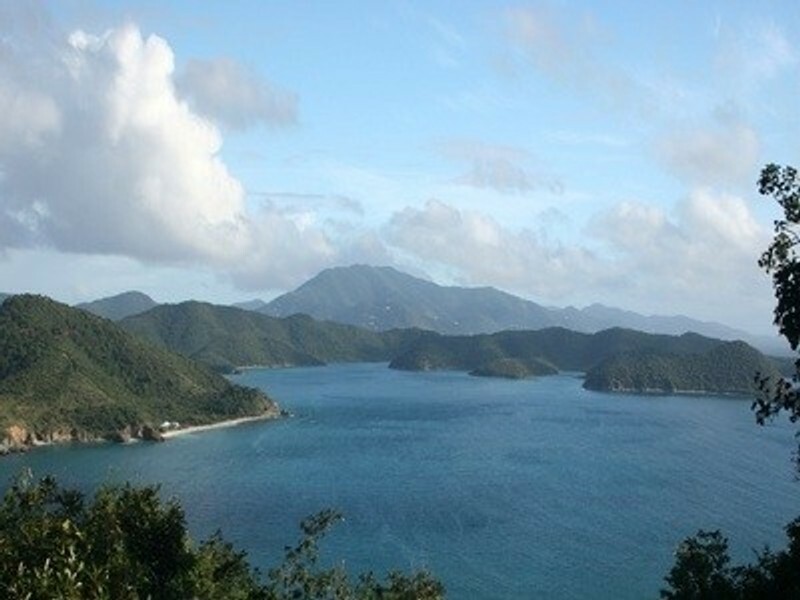 We have numerous storage areas in a compact home with a view that rivals any on the island. 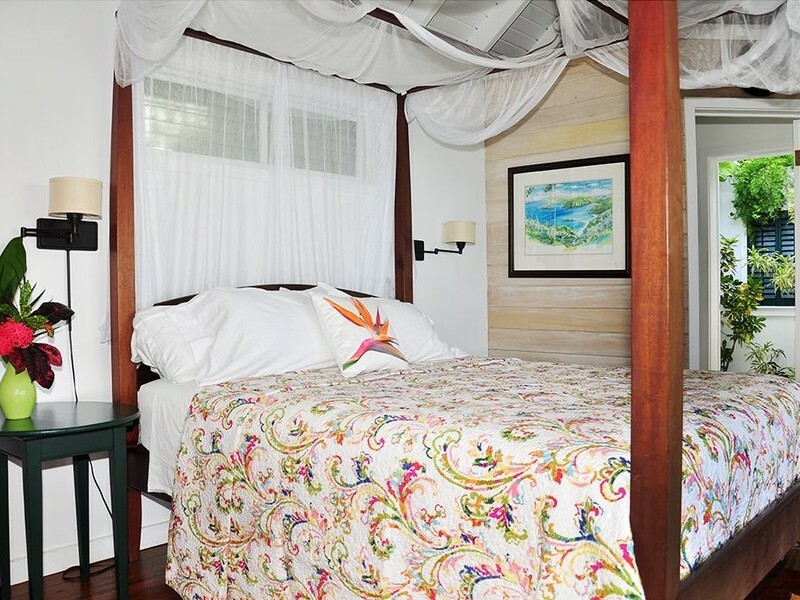 At Windwardside Guest Cottage you will wake up in a four poster bed to a gorgeous view of the Caribbean Sea framed by palm trees. You could easily create a post card from the view of this adorable cottage. The interior has a queen-size four-poster bed, a small seating area, a kitchenette and a breakfast bar. The furnishings are both tasteful and cheerful. 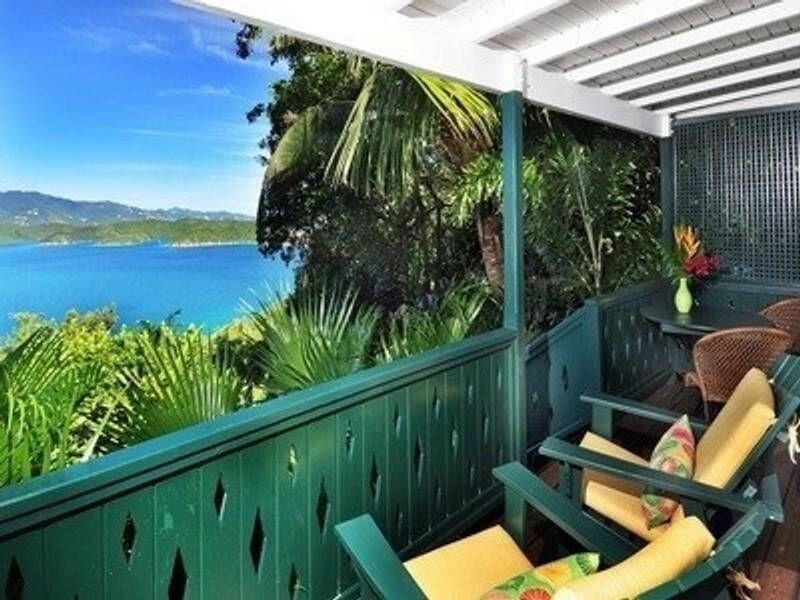 The covered porch has a dining area and two lounging chairs where you can enjoy the trade winds or good book while watching the sailboats pass by. 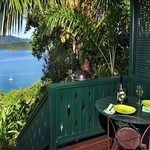 A small gas grill is also available if you prefer to prepare your meals overlooking the sea. 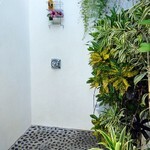 A shower garden opens onto an uncovered deck. 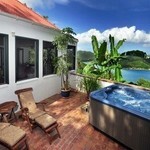 There you can have a relaxing evening soak in the hot tub under a starry Caribbean sky. 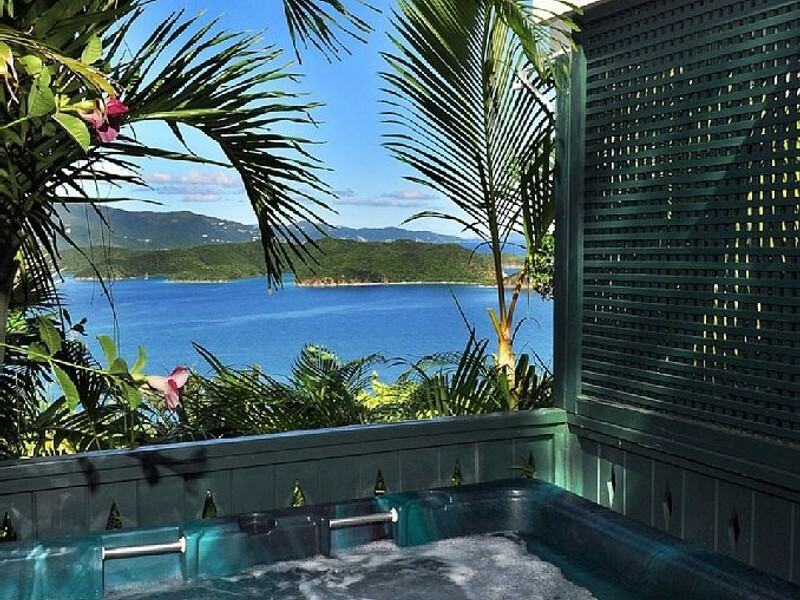 The hot tub also has a wide view of the sea and total privacy. 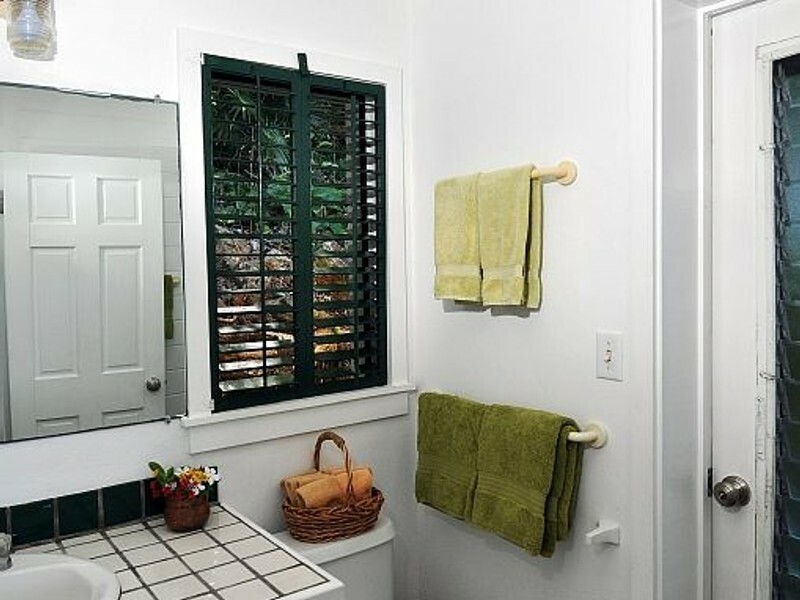 In short Windwardside Guest Cottage offers a serene location, fabulous view, charming furnishings, a private hot tub, kitchenette and bbq, plus dedicated staff that will organize your vacation from start to finish all for the price of a hotel room. 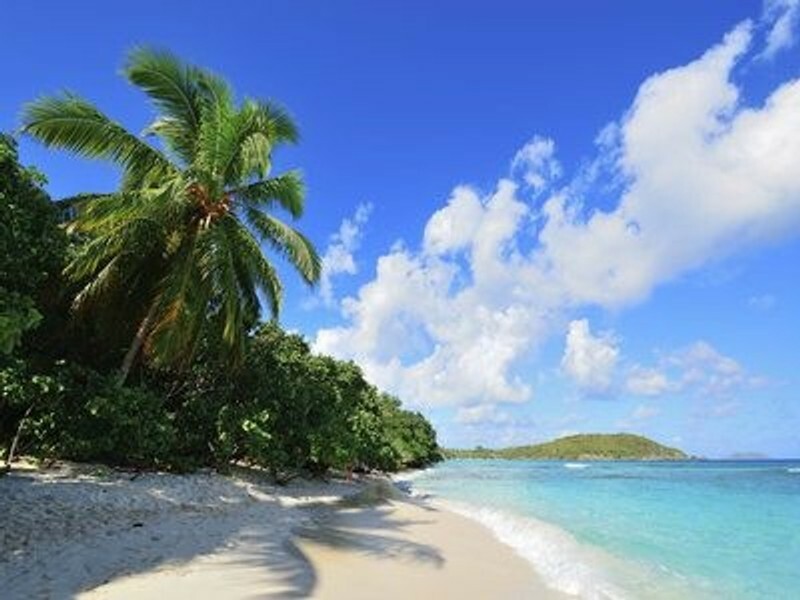 We provide snorkel gear, beach chairs, a cooler and a beach umbrella. "Our experience with the Calabash Cottage staff could not have been better, they took care of every detail! We had a wonderful trip and plan to return some day soon. We will most definitely do business with this rental company again. Thanks for everything!" "Perfect place for a 2 person getaway! All the staff made planning and everything on travel days go really smooth and stress free--arranging taxis, rental cars, and generally having good advice. The house itself was great, very small but has everything you need. The views from the cottage are amazing. The hot tub was great, we used it every night! The drive up from the main road to the cottage is pretty intimidating, but went well after the first time. Close to quite a few good restaurants on that side of the island. If you cook, make sure to clean the dishes right away and get up any crumbs, as the ants will find their way in quickly (but if you clean well won't be a problem). Also loved the outdoor shower!" "This cottage was all we expected from the exciting pictures on the web. It did not disappoint. The view was even better than expected. Everything was clean and well organized, with many extras helpfully available. 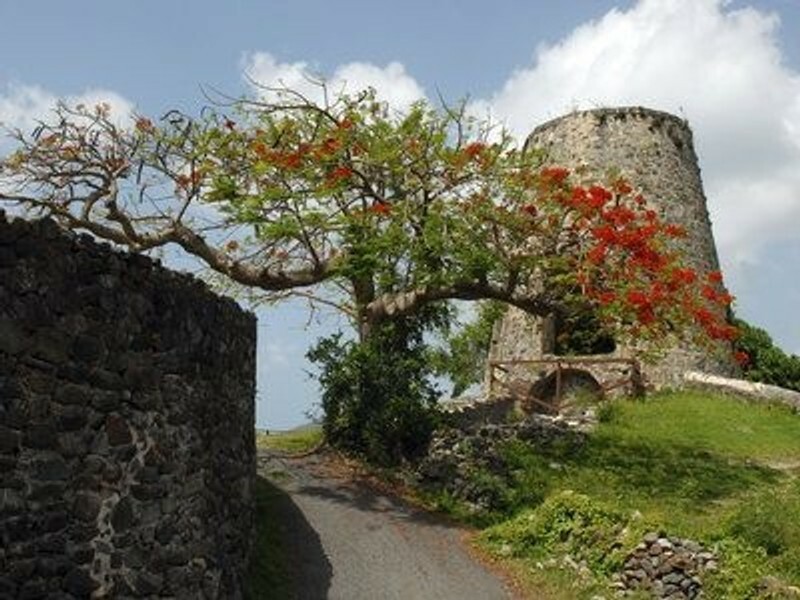 The location on the quiet side of the island a dream, with excellent restaurants nearby. They promised a 5 star vacation, and it was! Thanks to all." "The cottage was absolutely a paradise. It was tiny but clean and maintained down to the smallest detail. 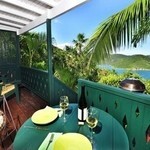 Breakfasts on the balcony with the stunning view will we never forget. We will be back!!! Thanks for everything!!!" "I'm happy to report that your cottage has a magical quality. 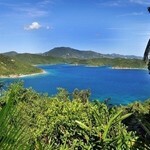 What an amazing, relaxing (albeit daily snorkeling, hikes and further adventures) lovely way to visit St. John. 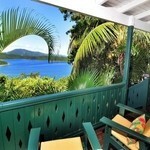 Windward Guest Cottage quickly became my new favorite place to stay! 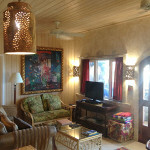 The pictures on the Homeaway website showed a tropical paradise but what we found here was so much more. "We had such a glorious time. The cottage is tiny but wonderful -- clean, airy, bright. There's no A/C because it's designed with windows on all sides and a ceiling fan to help the cross-breezes along. We were comfortable in mid-May. It felt like much more of a real island experience than staying in a resort. 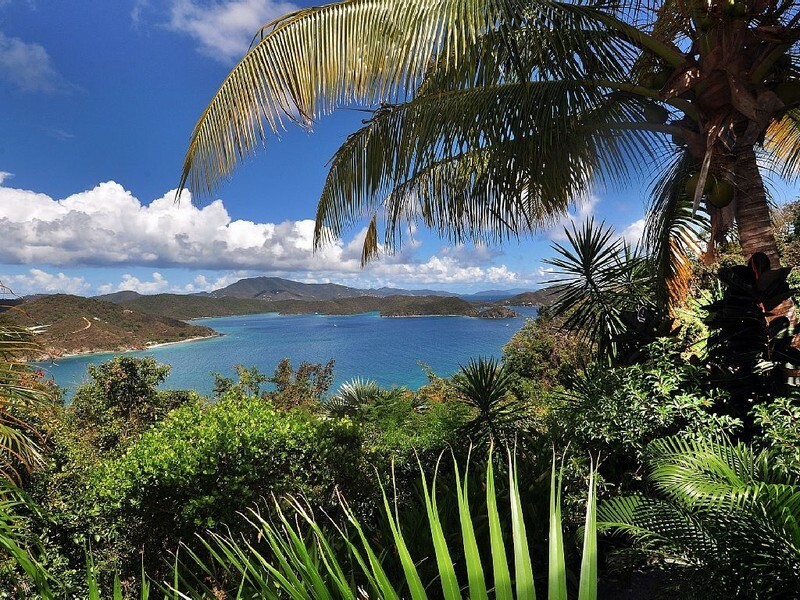 Word of warning: If you're going to the islands in May or later, be sure to bring plenty of DEET, because the mosquitoes will be out in force, including in the garden shower. As one local told us, "Better spray than dengue."" "Magnificent!" 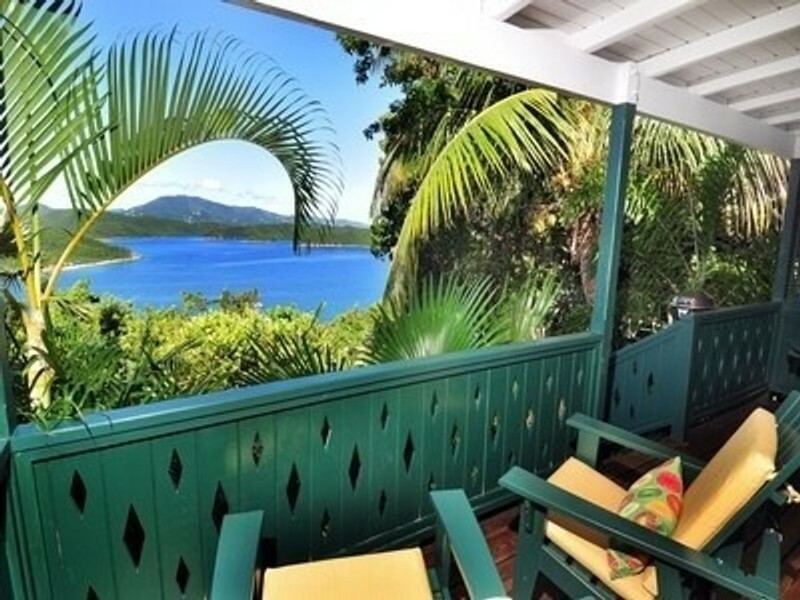 by John and Lynne T.
"This was our first visit to St John and now that we're in love with the island we can't imagine staying anywhere other than the Windwardside Guest Cottage - except perhaps another Calabash Cottages property. We just can't gush enough about this sweet little bungalow. Its setting is spectacular; the view will knock your socks off! A teeny note of caution for those less adventurous, the last mile approaching the cottage is slightly intimidating (steep, quite a drop down [thus the fabulous view!] and mostly not paved/bumpy). However, don't let that sway you – you get used to it by your 2nd or 3rd try and it's worth it. The cottage was perfectly appointed for two. Everything you'll need for your stay is there. The little galley kitchen will surprise you by how well equipped it is, between it and the grill we were very set to have most of our dinners in, and we're not talking PB&J here. The cottage was spotless and extremely well cared, particularly given how rough an island environment can be on metal, wood, etc. It appears as if it is tended to regularly. The level of service from this team was top-notch. Margaret & Diane answered all of our pre-arrival questions & provided great tips for our stay. Beth (aka Yoga Beth) met us at the ferry dock & generously spent about 2 hrs with us. In addition to what was promised (ferry pick-up, rental car retrieval, grocery stop in the big city, follow-me to the cottage), Beth took us to the National Park Visitor Center so we could pick up our tickets for a hike the next morning. 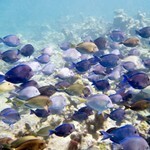 She also provided us some wonderful "local' tips on beaches for snorkeling and restaurants not to miss. Beth never once made us feel rushed; she really introduced us to the concept of island time. Oh almost forgot Warren from Dynamic tours, the car service from the airport to the ferry in St Thomas which was recommended & we highly suggest using it. It made our arrival & departure so smooth. 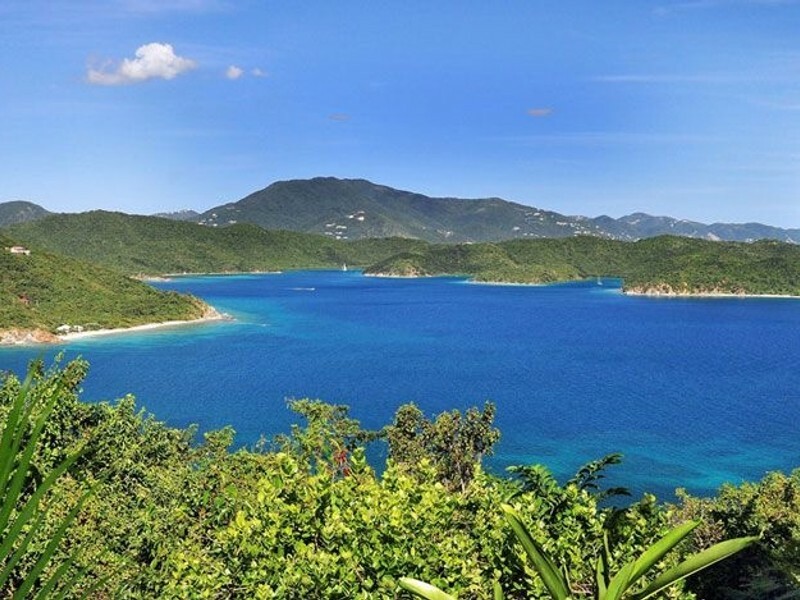 Warren was warmly welcoming & completely reliable, there for us at the airport despite that our flight was over an hour late & then he called at the end of the week to find out which ferry we were taking from St John so that he'd be waiting our arrival. Lastly, Susan (the owner?) called us the last night to be sure our stay had gone well. Really, this is stellar service that is rare to find these days. Thank you Calabash Cottage team. 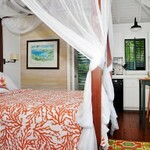 …..and for prospective future guests reading this: don't hesitate, this place is a gem!" "I am writing this a year later, but I had to give a raving review about this place! My husband and I came here for our honeymoon, and are longing to go back! Everything was incredibly clean, beautiful, and well taken care of. The view was indescribable, and the jeep rental was great! All of our transportation from the dock to our jeep rental place and then to our place was perfectly planned. We raved about this place so much that our friends decided to spend their honeymoon in one of the Calabash Cottages as well!! Thank you for providing the perfect place for a honeymoon in paradise!" 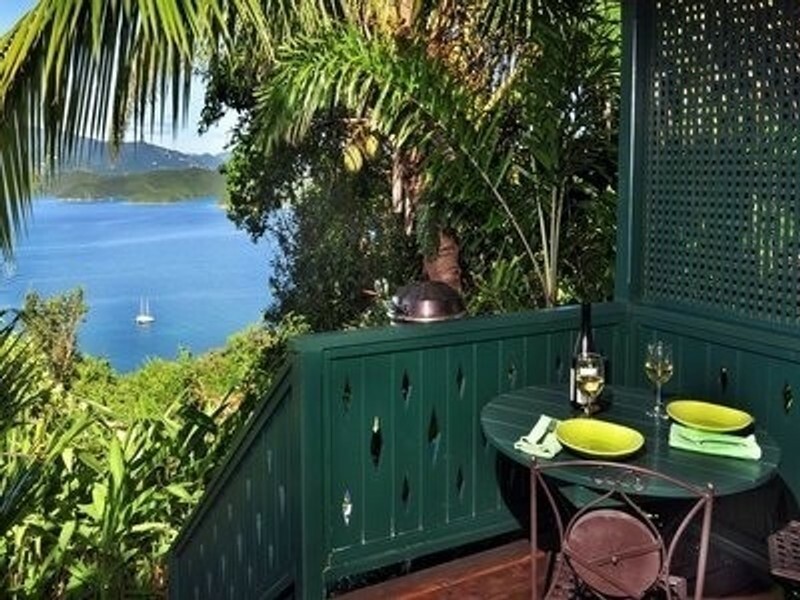 "Surround yourself with the natural beauty of Coral Harbor water and the lush green mountainside into which this lovely cottage has been built. We stayed for a week in this romantic getaway. We took multiple pictures from the four-poster bed of the water below, just to show how beautiful this setting was. The view from this cottage is outstanding, and as the ad says, we watched many sailboats entering and exiting Coral Harbor. We also watched a little hummingbird come back time after time drinking from the beautiful flowers growing just below the deck. 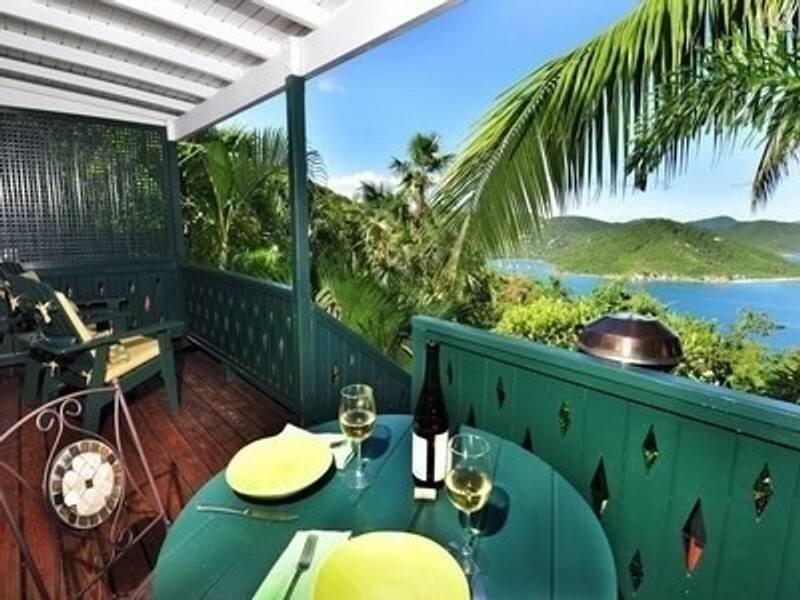 Whether you're showering, enjoying champagne in the hot tub, or eating dinner on the deck, you have the same view of the hillside and the harbor below. 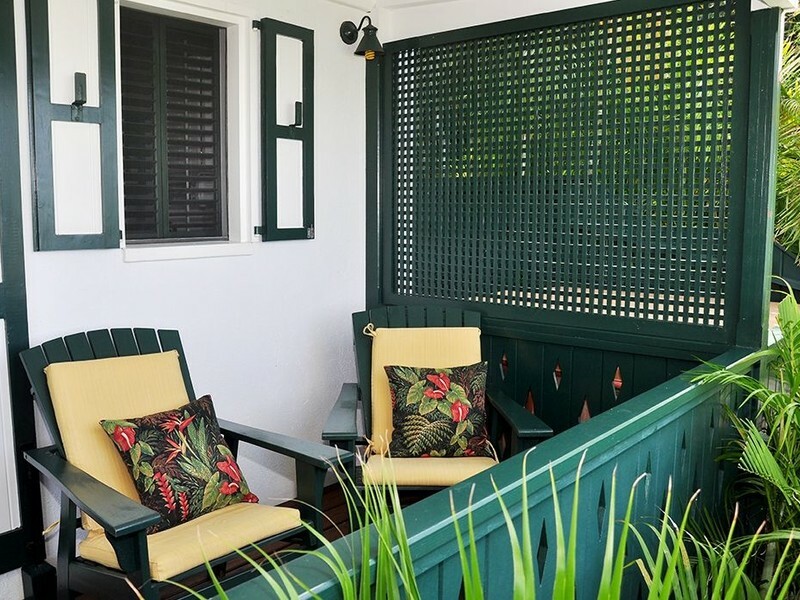 If you're looking for a romantic getaway, away from the hustle and bustle of the crowed hotels and city streets, this quaint tropical cottage is definitely the place." 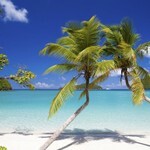 "MY WIFE AND I HAVE TAKEN SEVERAL CARIBBEAN TRIPS AND THIS WAS OUR ABSOLUTE BEST. ALL THAT THE OTHER REVIEWS SAY RE THE TRIP ARRANGEMENTS SUCH AS PLANE CONNECTIONS, JEEP RENTALS AND STAFF ATTENTIVENESS ARE VERY TRUE. 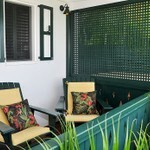 THIS COTTAGE IS VERY SECLUDED, PERFECTLY SIZED AND FEATURED TO MAKE YOUR STAY THE BEST IT COULD EVER BE. 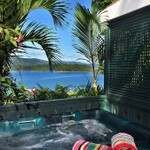 ESPECIALLY THE HOT TUB - SO VERY PRIVATE AND TO LOOK UP AT THE STARS WHILE LAYING THERE WITH A DRINK IN HAND IS JUST THE BEST EXPERIENCE ONE COULD WISH FOR - GENTLE BREEZES KEEP YOU COOL AND COMFY WHILE SLEEPING AT NIGHT AND THEN TO WAKE UP TO THE ISLAND VIEW - OH MY !!! THE SNORKELING IS TO DIE FOR - VERY MANY LOCATIONS WITH OVERFLOWING OCEANLIFE FROM RAYS TO TURTLES TO BARRACUDA ( NOT A CONCERN ) TO STARFISH TO OCTOPUS TO SHARK - MORE THAN ONE COULD HOPE FOR. WE HAD SUCH A WONDERFUL TIME WE SO HATED TO LEAVE - WE WILL BE BACK AND STAY LONGER EVEN THAN WE DID THE FIRST TIME. WE CANNOT SAY ENOUGH GOOD RE ALL THE FEATURES OF THE COTTAGE, THE STAFF, THE FOOD ON TH ISLAND, THE SNORKELING AND THE FRIENDLY FOLK ON THE ISLAND. 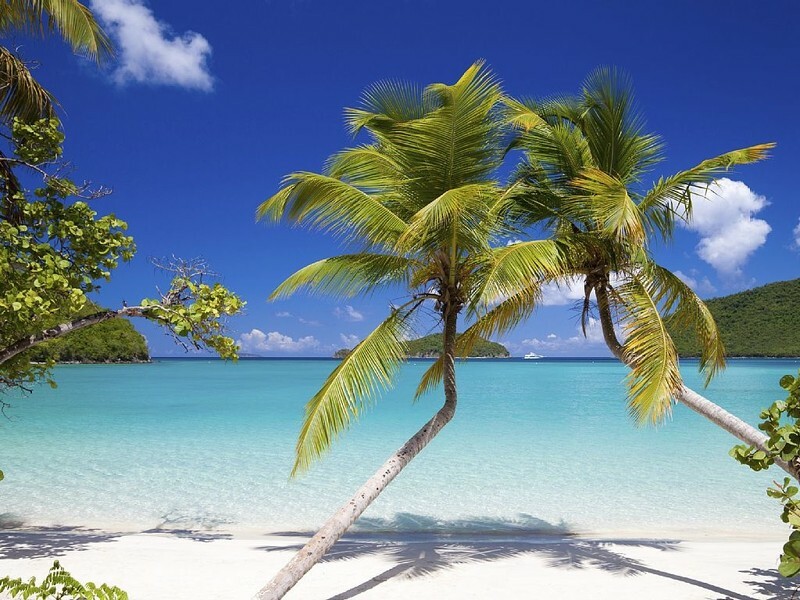 PLEASE PLEASE DO NOT PASS UP THE CHANCE TO SEE ALL THAT THE COTTAGE AND THE ISLAND OF ST JOHNS - US VI - HAS TO OFFER - YOU WON'T REGRET COMING TO SEE THIS ISLAND PARADISE WHICH BYW IS VERY EASY TO GET TO BUT OH SO HARD TO LEAVE !!! TODD / LAURIE"
"We just returned from a wonderful week long stay at the Windwardside Guest Cottage (Feburary 24-March 3, 2013). 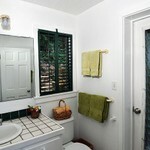 The cottage is even nicer then the pictures on the web site! 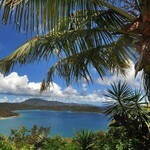 The view from the porch looking down on Coral Bay is incredible. Diane and Susan were both terrific to communicate with prior to our arrival and made sure we had all the information we needed. Diane is just a local phone call away if you need any information during your stay. 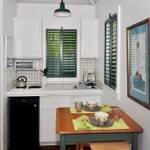 The cottage is very clean and well maintained and fully stocked even down to beach towels and snorkeling gear. I was pleased to learn that some of the electrical energy comes from five solar panels mounted on top of the porch – very Green! You will need a four wheel drive Jeep to get to the cottage and Diane took care of arranging that for us as well when we made our cottage reservation. Bruce met us in Coral Bay and made sure we got to the cottage as the first time up the road is a bit tricky. Bruce also answered our questions about the cottage and offered his insights on good snorkeling spots. The WIFI worked great in the cottage and so we streamed NetFlix movies on our Kindle at night. 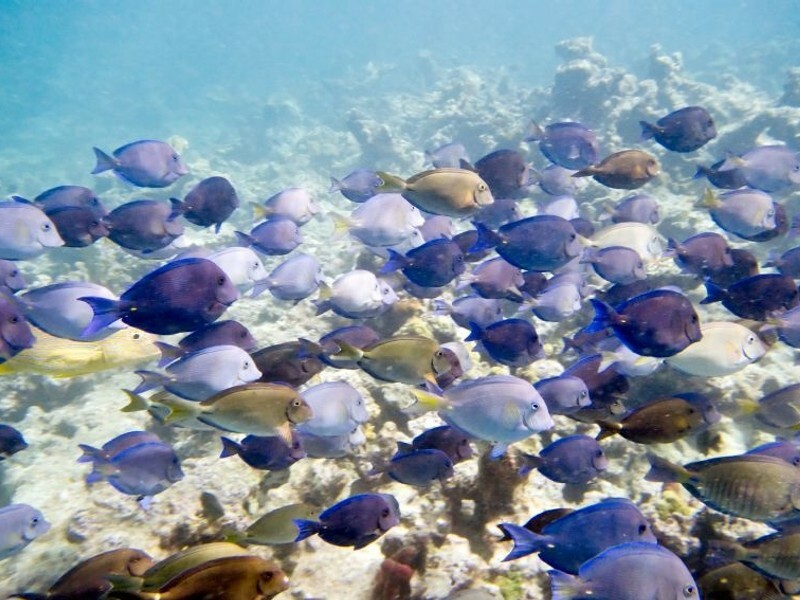 Pack your swimming suit, tee shirt, shorts, sun glasses and sun screen and head over to Waterlemon Cay, Haulover Bay, Salt Pond or Hansen's Beach for some great snorkeling and Miss Lucy's or The Shipwreck for fun dinners. Don't forget to have at least one lunch at Skinny Legs! 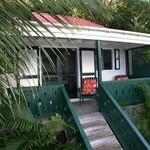 Sure hope we can stay at the Windwardside Guest Cottage again in the future! Special thanks to Diane for her great communications!" 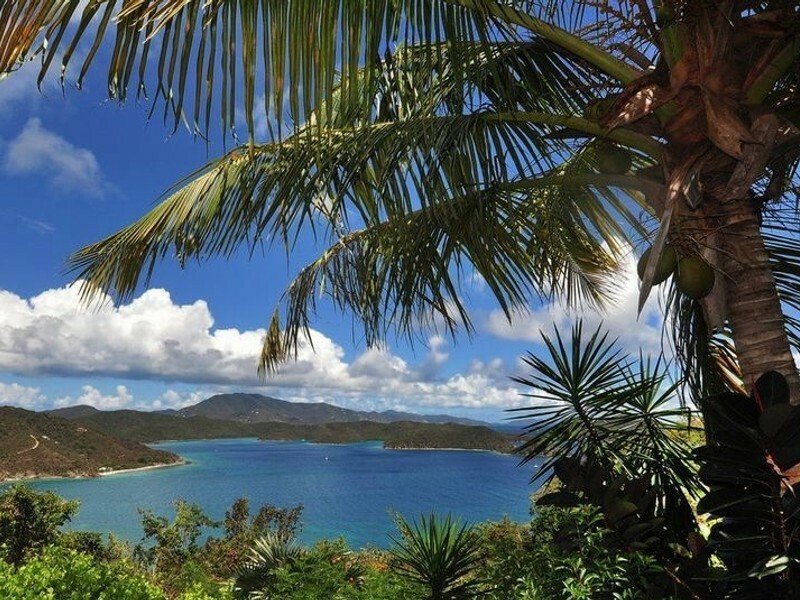 "My husband and I visited St. John for the first time and had an amazing vacation! We are already planning our next trip! 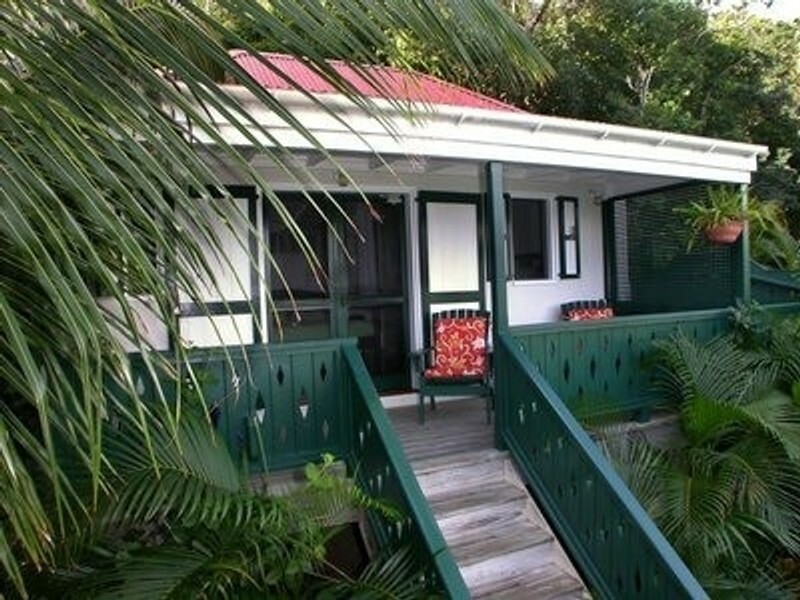 The Windwardside Guest Cottage was the perfect place for our romantic getaway! It was clean, comfortable and Susan and Diane were so helpful and accomodating from day one of booking my vacation. We had a problem with the water going out and they were there to fix it within 10 minutes of our call-what wonderful service! I loved waking up to the spectacular view from our cottage-it really is breathtaking! The outdoor shower was awesome too! 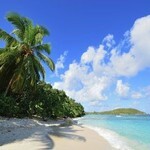 There are some wonderful restaraunts nearby and its a short drive to many beaches! It was really relaxing to end our busy day of exploring to get in the hot tub and look up at the stars. 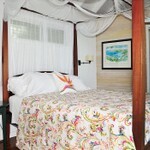 If you are looking for a small, cozy romantic place to stay on the island, look no further. This little cottage is perfect!" 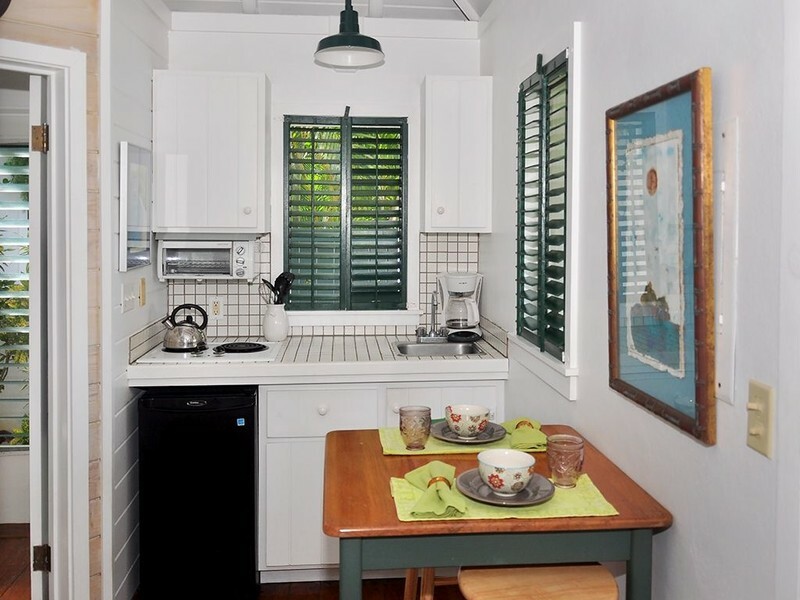 Windward side guest cottage is a small studio apartment perfect for my husband and I who just went there to eat sleep or recoup before our next excursion. 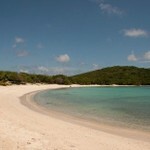 Location for us was great as our favorite outing was to salt pond bay, but other outings were a bit of a hike. Parking at the villa is tough and we didn't have to share it as you would if the main house has a rental. The weather was beautiful and the bugs were not bad, but the heat and the bugs could be an issue as there is no ac and the screens were infective against critters. The only other negative is the small fridge. The service we received upon our arrival was great! The views were amazing! 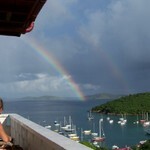 If you've never been to St. John it is a must!!! 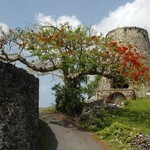 And windward side was a great choice for our intimate trip. I have no regrets and would stay there again and again, just thought these tidbits would be helpful to know if you'd never been the"
"I stayed at the Windwardside Cottage for my honeymoon and it was perfect for my husband and I. We had the most amazing time. The cottage is in great condition, clean, and adorable. It is very remote with a long bumpy drive (4 wheel drive only) up a steep road, but that made it more exciting and more private. The cottage is screened in with no AC, but it was not too hot at all, and I loved hearing the night sounds and the occasional night storm. I loved the grill, the hot tub on the porch and particularly the outside shower. Almost all restaurants in Coral Bay were closed for September, but I did not see this as a disadvantage becuae it felt like we had the island to ourselves. We went to a different hike and a different beach every day and each one was more beautiful and remote than the next. If you love nature, water and peace and quiet I highly recommend this cottage and this island. It will always be very special to me." "Great Headquarters for Snorkeling and Relaxing" by Ron H.
"I was traveling by myself on this trip and this little cottage was perfect. Very private with a fantastic view. 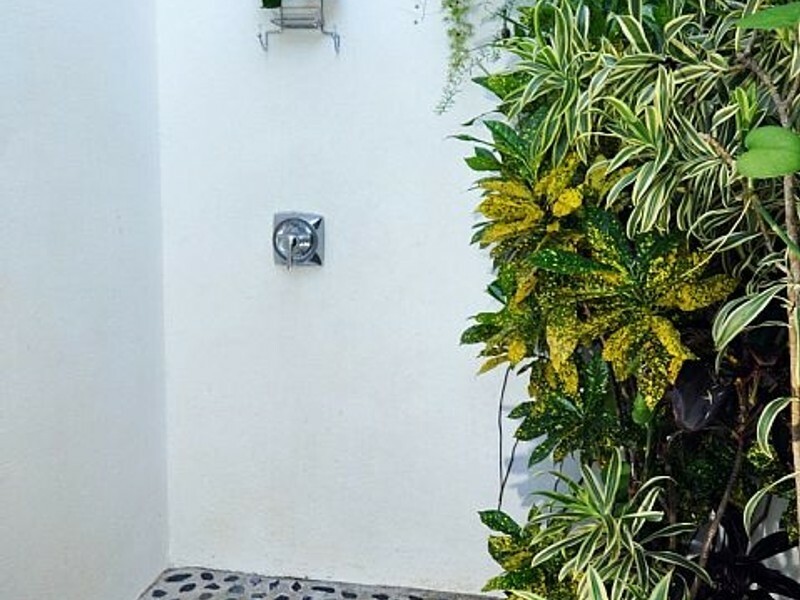 I loved the outdoor shower with large plants. I used the hot tub at least once a day and found it to be very relaxing. 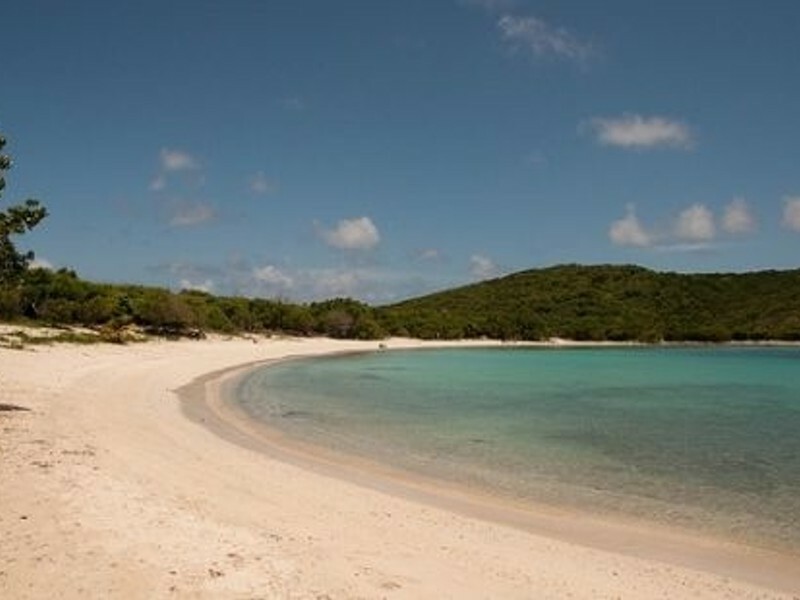 It was a 2 mile drive to Saltpond Bay which is known to have some of the best snorkeling on St. John. I took underwater pictures of two turtles there and a spotted eagle ray. The one turtle was over 3 feet long. I plan to come back to this location every year!" " My husband and I just returned from this wonderful vacation retreat last night! 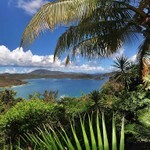 Although visiting St John was initially my idea/desire.....after our visit and stay at this cottage, he is totally onboard with returning next year! 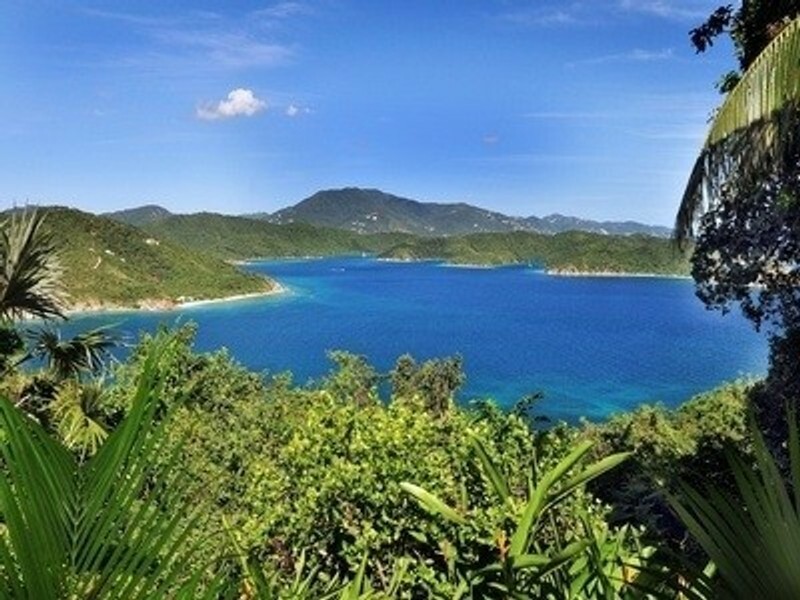 He fell in love with St John and the views and adventures offered by staying at this cottage is a large part of the reason why.....the gorgeous beaches helped a little as well... 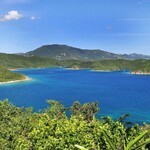 The rental process was a breeze with Diane and Susan's help and we were met at the airport in St Thomas and driven to the ferry...once in St John we were then met at the ferry and escorted to pick up our rental jeep and to our beautiful cottage. We have never had such service.....if you are looking for a beautiful secluded getaway...Windwardside cottage is the place for you! 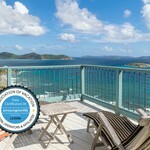 L, Laurel, DE"
"We had a great vacation on St. John and the Windwardside Guest Cottage was a big part of it. The cottage was exactly as described. The view of Coral Bay was wonderful. We loved the hot tub under the stars. We enjoyed the outdoor shower under the watchful eye of the lizards and geckos. We grilled on the BBQ and ate outside on the porch. We made good use of the snorkling equipment, beach chairs and beach towels that were provided. My wife really enjoyed our breakfast visitors, the bananaquits; they really love that sugar. One bird also had a fondness for OJ with a touch of Cruzan Pineapple Rum in it! The road up to the cottage is memorable but we had no problems with it, very bumpy though! Susan and her staff (Diane and Adam) were absolulely amazing. They helped arrange our transportation from the airport to the ferry as well as our Jeep rental. They were helpful when we had any questions about the island and were very responsive when the heater on the hot tub stopped working. Jumbie Bay Beach - if arrive late afternoon maybe you will have the entire beach to yourselves (like we did) - AWESOME! Hike to Rams Head. What a view! 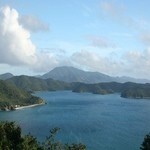 The Ranger led Reef Bay Trail Hike was fun and informative. Had dinner at Skinny Legs and Shipwreck Landing and breakfast at Donkey Diner. All were good." "All your worries melt away walking in the door. 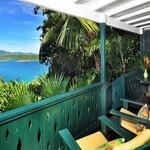 A beautifully maintained villa, all the comforts of home- with a view that's purely AMAZING. 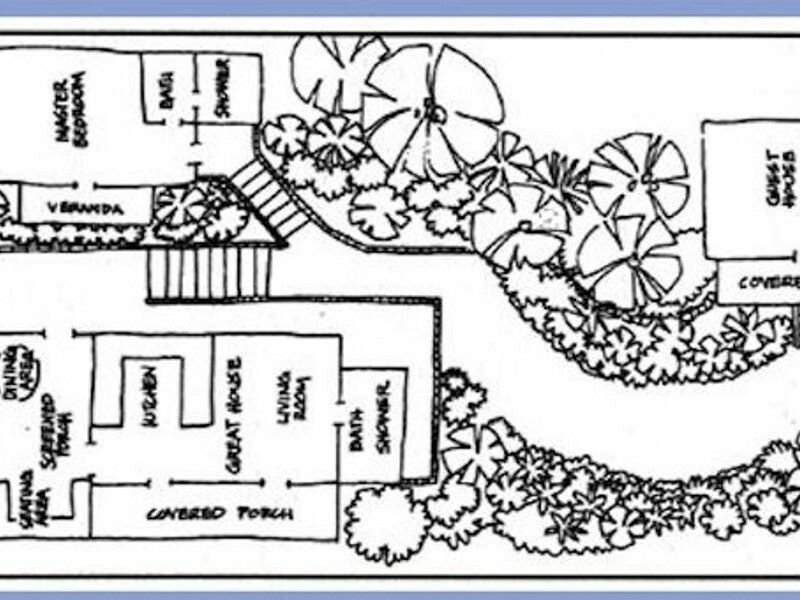 A romantic retreat from the stressors of everyday life. Clean as a whistle.